Clare Hall, University of Cambridge, in collaboration with BP, one of the world’s leading international oil and gas companies, is hosting “The BP and Clare Hall India Innovation Masters Programme” to support graduate students from India who want to develop their academic career in the energy sector. The programme enables students to study for a Master’s degree in any of the STEM subjects related to the energy sector for up to one year at the University of Cambridge. The University of Cambridge has had a close relationship with India for more than 150 years and has educated many leading Indians, including three Prime Ministers. At any one time there are over 200 students from India studying at Cambridge. The University’s institutional relationships with its partners are based upon the pursuit of excellence and partnerships such as this reinforce our commitment to work with India on addressing critical issues of mutual concern. The BP and Clare Hall India Innovation Masters Programme hosted at Clare Hall, a college for advanced study, offers graduate students from India the opportunity to study at the University of Cambridge and join in collegiate life in a fully integrated manner. They will meet academics and students from many countries, and can interact academically and socially with members of Clare Hall and other colleges and departments in the University. At present, there are students from over 50 countries at Clare Hall with most academic disciplines represented. Students awarded the BP-Clare Hall India Innovation Masters Studentships can apply to a wide range of course across those academic disciplines broadly related to the energy sector and allied areas. What are the criteria for eligibility for a scholarship? The aim of the BP Clare Hall India Innovation Masters Programme is to encourage applications from candidates who will follow a career in academia, industry or government. The emphasis is on future leadership. Candidates must be first accepted by a Department or Faculty of the University of Cambridge for one of the approved courses listed below. They must also nominate Clare Hall as their first choice college. There is no special form in addition to the general University application form. A panel – including College Fellows and representatives from BP – will meet after the closing date of 1 May 2019 to make decisions and applicants will be notified by 1 June 2019. In the pursuit of becoming better than I was yesterday, I always dreamt of learning and refining my business acumen from one of the world’s leading universities. This dream was emblazoned in my mind and I decided to fulfil it at the Judge Business School, University of Cambridge. Financial aid was a prerequisite that made me explore the list of all the scholarships and bursaries available to Indian students. By chance, I came across a most generous and unparalleled scholarship named ‘The BP and Clare Hall India Innovation Masters Programme’, offered by Clare Hall College, which supports graduate students from India. This studentship enabled and supported me to move ahead and turn my dream into reality. Becoming a part of small and strong community of Fellows, Life Members, staff and students of Clare Hall gave me an opportunity to forge new connections and exchange ideas with some of the best minds from around the world. From abundant guidance from Tutors and Fellows, to making new friends at seminars, formal dinners and cultural events, Clare Hall has made this enriching experience truly memorable and meaningful. I am grateful to Clare Hall and BP for giving me the opportunity to enhance my academic growth and supporting me to scale new heights professionally. 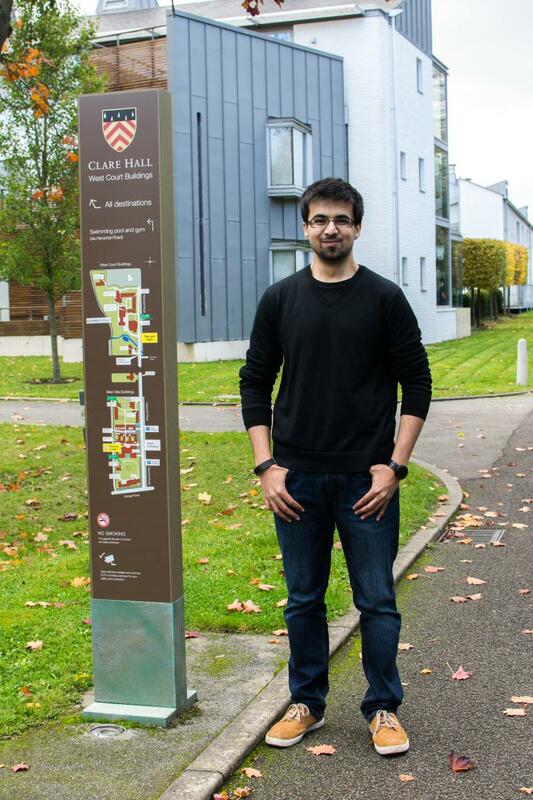 The University of Cambridge is one of the premier research institutions in the world, and hence was a natural choice for me to pursue my education. When it came to choosing a college within Cambridge though, it is an understatement to say that I was at a complete loss, having not been exposed to the collegiate system previously. Fortunately, my decision became quite trivial once I discovered Clare Hall. Using the Innovation Masters Scholarship, BP and Clare Hall provide probably the most generous funding for Masters students that I have seen across all 31 Cambridge colleges. For my particular programme, the scholarship completely covered my tuition costs and related fees. I am grateful for the existence of such a scholarship since it allowed me to concentrate solely on my research without having to worry about steep tuition costs or education loans. The ability to focus entirely on the education one receives, rather than the process of how to finance it, is the single greatest advantage a student can have and it is one that this scholarship has rendered me. I would be remiss not to mention why Clare Hall is a key component of this scholarship, and why it is not just a matter of the funds being provided. The friendly, intellectually stimulating and diverse environment that this college provides is what makes this scholarship truly invaluable. The people you meet throughout the college - at the Dining Hall, at cultural events, in the library or even at the bar, create an atmosphere that is truly conducive to learning. I am indeed fortunate to have had access to such an opportunity and am grateful to both BP and Clare Hall for having provided it. 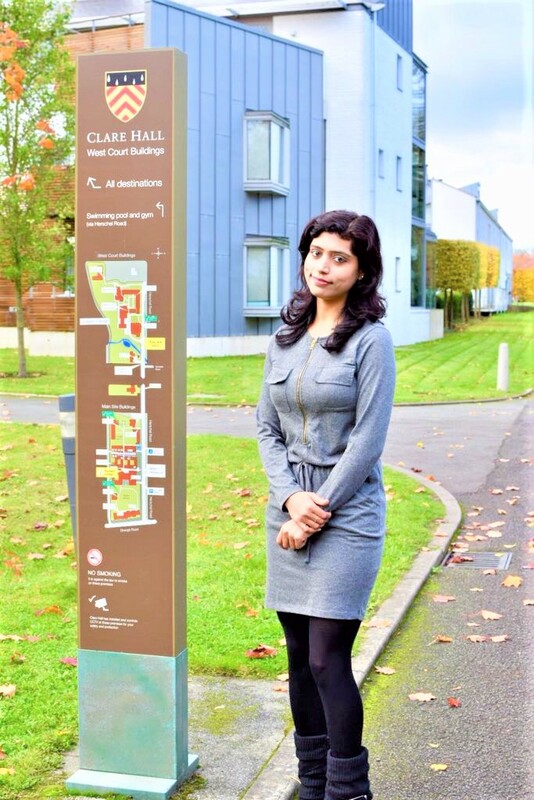 The BP-Clare Hall Studentship is a paragon opportunity for Indian students to study at Cambridge. 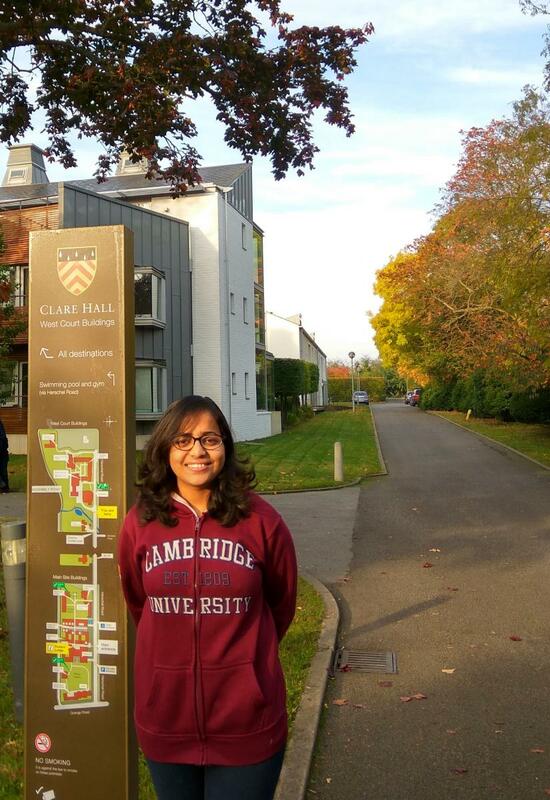 Hailing from a small town to study at one of the leading universities in the world felt like a mirage but the support provided via this studentship and the college enabled me to pursue my Cambridge dream. Apart from the crucial financial aid, the college also guided me during the application. In a short time, I came to respect and value Clare Hall’s integrated academic community. From attending seminars, special talks to joining students and Fellows for lunch at college, everything is an ever learning and enriching experience. By interacting with scholars from divergent fields, one gains a better perspective of academia which is not limited to their field of expertise. It is an honour to be the first recipient of BP – Clare Hall studentship and I will forever be grateful to Clare Hall and BP for supporting my aspirations. Interested candidates should in the first instance apply to the University of Cambridge. Further information can be found at www.graduate.study.cam.ac.uk/how-do-i-apply. Clare Hall should be stated as their first choice college. BP will work with Clare Hall to shortlist successful applicants. The next group of recipients of this award are expected to start in Michaelmas 2019. This scholarship will provide funding up to a maximum of £30,000 towards course fees and maintenance, excluding costs of travel to and from the UK. Costs will vary depending on the choice of course. Please see relevant pages on the University of Cambridge website for information on costs and application deadlines.